Having started a company myself, and being in touch with many early-stage startups, I am aware of the problems that small businesses face when it comes to dealing with company registration, managing Profit and Loss statements, keeping a tab on the budget and tracking the monetary expenses. Of course, you might have a CA, but it helps if you know the ins and outs yourself. Intuit India, a leading provider of business and financial management solutions for SMEs (small and mid-sized businesses) and National Institute of Entrepreneurship and Small Business Development (NIESBUD), Noida, a premier national level institution engaged in promotion of entrepreneurship and development of small businesses in the country through different interventions of training, research, consultancy etc. under the auspices of the Ministry of Micro, Small and Medium Enterprises (MSME), GoI, have come up with a solution. They have developed a specialized course on financial management for Indian small business owners. While I am always a bit skeptical when institutes come up with courses on Entrepreneurship, this one looks like it has got the ingredients; in terms of practicality, suitability and necessity, in the perfectly right combination. The Modules are comprised of three stages of learning: How to Start a Business; How to Manage a Business and, How to Grow a Business. Module 2: How to Manage your Business? How You Can Monitor Financial Indicators? Don’t Forget to Pay the Government on Time! Where and How to Find Assistance? Module 3: How to Grow Your Business? How to Budget for Growth? Manage Your Personal Finances, too! What makes this course unique is that it is interactive and discussion-based, and incorporates group exercises based on real business situations, which encourages peer-learning, in the hopes that the entrepreneur or small business owner is better equipped to navigate complex issues, like how to successfully obtain a loan, manage a budget and effectively budget for projects. As a precursor to introducing the Module across India to small businesses in the coming months, the curriculum was first introduced during the Training of Trainers (TOT) organized by NIESBUD at Nainital from May 21st to June 6th for Senior Faculty of its Partner Institutions. The TOT is expected to train 40 to 45 trainers from across the country including a few small business owners themselves. What do you guys think of this collaboration? Comment, with your views, on whether courses like these are the need of the hour to further the cause of Entrepreneurship in India. thank you for your positive input! 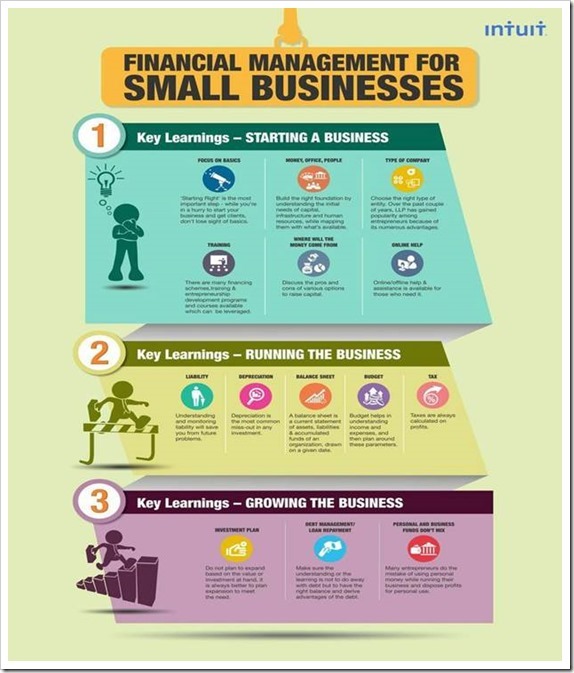 I am looking into making some handouts for MLM strategy, and I am intersted in your infographic on “financial management for small businesses”. The content of this picture above in the text is too small to read. Is it possible that I can get the original picture or the text that is in the original picture? Warm greeting and have an excellent day!